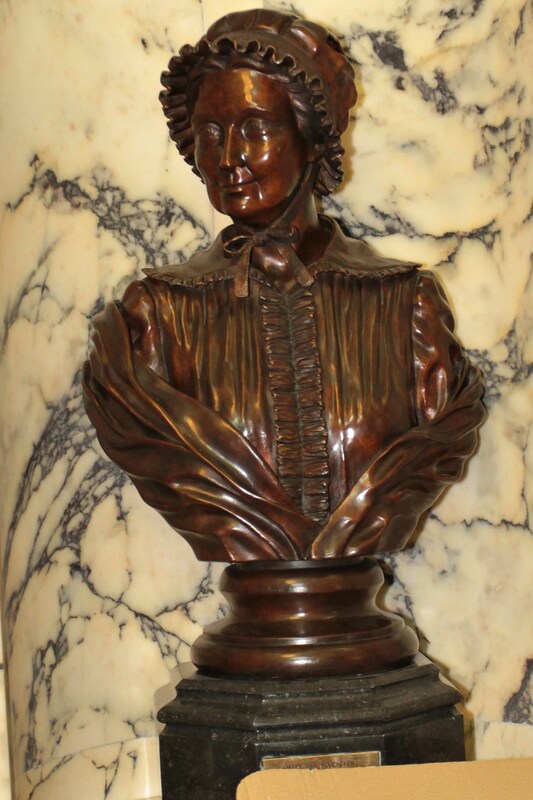 This is a bust of Mary Ann McCracken which is on the first floor of Belfast City Hall. It has recently been placed in City Hall in an attempt to reflect a more balanced narrative of the history of Belfast to reflect the role of nationalists and women. McCracken was born in Belfast. Her father was Francis McCracken, a prominent ship-owner; her mother Anne Joy came from another wealthy family which made its money in the linen trade and founded the Belfast News Letter. Mary Ann’s liberal and far-sighted parents sent her to David Manson’s progressive co-educational school, where ‘young ladies’ received the same education as the boys; Mary Ann excelled at mathematics. She was the sister of the Irish rebel Henry Joy McCracken, who was executed in Belfast following his role in the Battle of Antrim in June 1798. After the death of her brother, whom she tried to resuscitate for five hours after he was hanged, Mary Ann took over the care of his illegitimate daughter, Maria. After Henry’s execution in 1798 she and her sister Margaret opened a muslin manufacturing business at 27 Waring Street, Belfast. Mary Ann never married, but in her youth paid a good deal of attention to a leading United Irishman, Thomas Russell, whom she described favourably and at great length in her diaries. She died on 26 July 1866 at the age of 96 years. She is buried with her brother, Henry Joy, in Clifton Street Cemetery.